Tunisia's Dictator is Out But What's Left Behind? 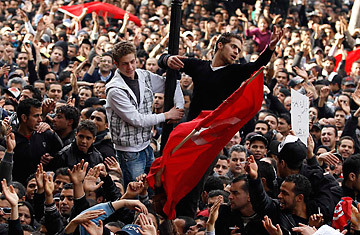 Protesters demonstrate against Tunisian President Zine al-Abidine Ben Ali in Tunis, January 14, 2011. In the hours after Tunisia's President Zine el Abidine Ben Ali on Friday fled the country he'd ruled with an iron fist for 23 years, many commentators rushed to proclaim the end of an era. They saw in Tunisia's unprecedented popular uprising a portent of democratic transformation spreading through the Arab world: Supporters of Tunisia's rebellion waved Tunisian flags in capitals across the Middle East; in Doha, Qatar, a jubilant crowd reportedly gathered outside the offices of Al Jazeera, the regional news giant that had brought live real-time coverage of weeks of mass demonstrations and bloody police crackdowns to TV screens across the Middle East. But the euphoria may have been somewhat premature. In Tunisia, a state of emergency remains in force with brutally enforced dusk-to-dawn curfews. Ben Ali has stepped down, but the protests  and the violent crackdown by security forces  are far from over. Al Jazeera reported that lawyers in central Tunisian towns were already agitating against the current "temporary" President Mohamed Ghannouchi, a technocrat economist who had served as Ben Ali's Prime Minister and is largely derided by the Tunisian public as the ousted president's yes-man. It's unclear what role  if any  Ghannouchi had played in coaxing Ben Ali's departure, nor is it certain that the current interim regime has any interest in delivering on protesters' demands for genuine democratic reform. Late Jan. 14, the same day Ben Ali departed, Ghannouchi promised on state television to meet soon with the country's traditionally cowed and weak opposition parties to discuss the way forward. Yet, most observers believe Tunisia's military remains the ultimate arbiter of power in the country. Some speculate that the generals saw the protests a real threat to the status quo and decided to salvage the situation by engineering Ben Ali's exit. "This could very well be an attempt of an entrenched elite to maintain its position," says George Trumbull, an associate professor of history at Dartmouth College and an expert on Tunisia. Ironically, it was precisely such a scenario that had brought Ben Ali himself to power in 1987. He had served as Prime Minister to then President Habib Bourguiba  Tunisia's only other ruler since the former French protectorate gained independence in 1956  he replaced his boss in the wake of a bloodless coup. Ben Ali, then a favorite of the military, had justified the move on the grounds that Bourguiba was enfeebled by Parkinson's disease, prone to increasingly erratic behavior and no longer capable of governing. Thus began the Ben Ali era, which followed very much in the footsteps of his ousted predecessor, wielding the power of the security forces to compel Tunisians to accept a social contract that assured prosperity and stability at the expense of political freedoms. For many people, particularly in the country's wealthier Mediterranean coastal cities, that deal paid off. Tunisia boasts a GDP per capita of roughly $8,000, among the highest in Africa, and education levels that outrank much of the developing world. But Tunisians have chafed against life in a brutal police state where freedom of the press is non-existent and abuse at the hands of government security forces is commonplace. A July 2009 U.S. diplomatic cable, released by WikiLeaks, describes the rot beneath the seemingly stable exterior of Ben Ali's Tunisia: "Increasingly, [Tunisia's leaders] rely on the police for control and focus on preserving power. And, corruption in the inner circle is growing. Even average Tunisians are now keenly aware of it, and the chorus of complaints is rising." The leaked cables describe the widespread loathing of Ben Ali's wife, Leila Trabelsi, whose family is at the source of much popular anger over the gross excesses of the country's ruling elite. The rebellion was sparked by a grisly act of self-sacrifice last month, when an unemployed college graduate publicly set himself on fire after police had allegedly beaten him for trying to sell vegetables without an adequate permit on the streets of a poor, hinterland town. (He later died of his injuries). Fierce protests exploded across the country's south and central regions as a younger generation frustrated with a lack of jobs vented its rage. The killing of dozens of protestors as the government cracked down simply triggered greater outrage, with mass protests finally reaching the capital over the past week. Social media and the relentless reporting of the clashes by Al Jazeera and other news organizations helped fan flames of dissent that had seemed politically dormant for decades. As one protester told the Financial Times: "We have changed, thanks to the young people. Before we couldn't even say yes or no." Despite the uprising's unexpected victory in forcing Ben Ali to flee, it remains difficult to predict the direction of what local observers say is a spontaneous protest wave with no leadership or organizational structure. Traditional opposition political parties have largely been spectators to the upheaval. Riven by factionalism, subdued by years of authoritarian rule, and willing participants in a series of fraudulent elections, some analysts doubt whether they can offer an alternative acceptable to those who've forged their own power on the streets. More radical elements  Islamists and communists  have been suppressed by Ben Ali's security state, driven into a twilight underground existence or forced into exile. Hizb al-Nahda, or the Renaissance Party, once a prominent Islamist opposition group allied with Egypt's Muslim Brotherhood, now keeps its headquarters in London. While the post-Ben Ali future remains unclear, what has happened over the past week was a rupture of decades of secular authoritarianism under successive pro-Western dictatorships that suited the U.S. and many Western European countries. Tunisia was marketed as an island of stability in a chaotic geo-political sea, flanked by Libya under Muammar Ghaddafi and an Algeria locked into a bloody civil war between religious fundamentalists and former socialist revolutionaries. The cautious statements now coming out of Paris and Washington reflect anxiety over what will replace Ben Ali. "This is a reckoning, but we have to wait to see what kind of change can come out of it," says Trumbull of Dartmouth College. "A democratic regime in Tunisia, or in many other parts of the world, often may not look like what Washington wants it to be."